Have you ever received a newsletter or promotional material, viewed signage, an art composition or website with font combinations that just made you cringe? It could be that the lettering used was a single font but was executed inconsistently. Maybe it was a composition that used so many typefaces that it looked like the result of an explosion in a font factory. When you have access to a range of fonts it can be tempting to use too many. Likewise, if you are not attentive to variations in style you can make some less-than-appealing pairings. It could be my background in sign painting and experience as a technical illustrator that make me sensitive to poorly executed typography. Whether or not you have a technical background like me, chances are you recognize bad lettering too. No one wants to be the victim of bad typography. The question is, do you know how to avoid a disastrous outcome? This article is the first in a four-part series focusing on the effective use of lettering in design. For details on product recommendations and links please see my full disclosure. Ready-made fonts are a wonderful asset. Many design issues can be remedied simply by choosing a font rather than attempting to hand draw text. Type design is an art and there are many skilled font developers who work diligently to provide you with the ability to effortlessly create stunning compositions that incorporate text. Myriad free font sites exist where you can download fonts in a wide range of styles. It is imperative that you read the terms of service for each font that you wish to use. Free does not give you carte blanche. Nor does it imply permission to use it in a commercial setting. Some are defined as "free for personal use”, which means no commercial use of any kind. No use for instructional materials that will be sold. No POD (Print on Demand). No websites that generate sales or donations. Think of “personal” as meaning private. I stay away from fonts restricted to personal use only because it is too easy to accidentally grab a restricted font from my font library. I don’t want to have to go back and research font permissions if I want to sell or license a version my work. Some fonts simply say “free” but you still need to read the documentation that comes with the font. There you will find details such as whether a donation is required for commercial use or if commercial use is prohibited altogether. Other fonts are marked “donation”. Again, you need to determine what conditions apply for authorized use. To be on the safe side, look for the phrase “free for commercial use”. Although you will find many fonts that can be downloaded for free, the selection is somewhat limited and completely free fonts often look dated or lack any “wow” factor. Others are missing elements such as numbers and special characters. It used to be a bit pricey to purchase fonts. Many were sold in collections so, to get the one that caught your eye, you had to pay top dollar for an enormous collection of fonts that you would never use. Now you have a plethora of on-trend, beautiful fonts at your fingertips! You can buy single font families that include versions of the same font such as regular, bold and italic, or purchase font bundles at steeply discounted prices. I'm often asked about the fonts I use when designing. I'll let you in on my secret. One of my go-to resources is The Hungry JPEG. Their downloads come with a complete license so they can be used for personal as well as commercial projects. The Hungry JPEG offers freebies, individual fonts (most sell for under twenty USD) plus they offer limited-time, one-dollar deals. My favorite way to purchase is bundles. These are deeply discounted and you receive a range of fonts, which makes this by far the most economical way to purchase. Another favored resource is Font Bundles. They offer several licenses so be sure to check the terms for each download. Font Bundles offers many of the same options as Hungry JPEG including design resources, free fonts as well as one dollar deals, which are a great way to selectively grow your font library. Once you purchase your favorite fonts you are tasked with selecting the right font(s) for your project. 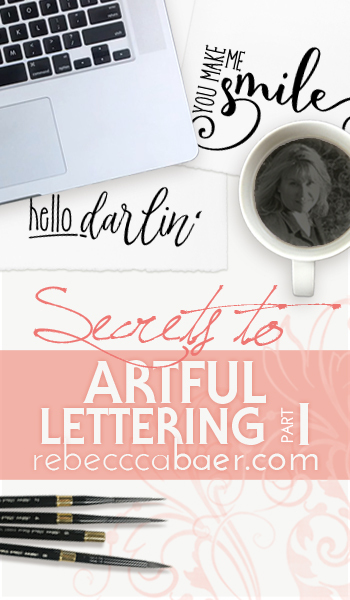 The good news is, that's the focus of part two in this series on the secrets to artful lettering.